Brandon Alter (creator/writer/producer) Brandon Alter is a Los Angeles based writer and performer who graduated from the USC School of Theatre. His play “Forty Miles from Tel Aviv” won him the California Young Playwrights award at age 18 and went on to have professional productions around the country, including San Diego’s Old Globe Theatre and Stages Theatre in Houston, TX. While attending college, Brandon studied playwriting with acclaimed storyteller Oliver Mayer, song writing and music theatre composition with Tony winner Jason Robert Brown, and had the privilege of interning directly under renowned artistic director Michael Ritchie. USC awarded his play, “Masterpieces”, the 2008 Stanley Musgrove Award for Creative Achievement. Since college, Brandon has been building a successful acting career with standout performances on stage and most recently in the Lionsgate/Roadside Attractions feature film “Dear White People”, the new Netflix series “Girlboss”, NBC’s recently cancelled “Heartbeat”, and on the TruTV hit sketch series “Rachel Dratch’s Late Night Snack”. His biggest passion is giving his alter-ego, Brandonna Summer, the life she deserves on both stage and screen! Brandonna Summer (Herself) considers music her first love, as an internationally acclaimed song-writer, pop star and DJ, one would hope so! But she has also served as model and muse to Karl Lagerfeld, Kenzo, Yohji Yamamoto and Gwen Stefani, just to name a few. A multi-hyphenate, Brandonna has also appeared as a versatile comedic and dramatic actress, most recently on Rachel Dratch’s “Late Night Snack” and NBC’s recently canceled “Heartbeat” (she had nothing to do with that, she promises! In fact if they had put more of her scenes on the air, it would probably still be running today.) In her spare time she relishes providing heart-centered life-coaching to wayward teenage girls and organizing an annual fashion show for the ASPCA with three-legged dogs and cats who are still able to walk in heels. Brandonna splits her time between Los Angeles, New York City, and Saint-Tropez. Other projects in the works include: a television show starring herself, a metaphysical children’s book for adults and her inspirational self-help video series “Brandonna Summer Says”. Mommy loves you… But she loves herself more! Carol Angeli (Marcy Chung) is tickled to spend summer w/ Brandonna! Off Broadway/NYC: Here Lies Love (The Public Theatre), Sayonara (Pan Asian Rep), Flappers in Chains (NAAP). National Tours: Mary Poppins (First National Tour), Radio City Christmas Spectacular. Favorite Regional: Miss Saigon (Kim), The King and I (Uncle Thomas/us Tup Tim), Carousel (us Louise), The Mistress Cycle (Ching), South Pacific (Liat), West Side Story (Anita), Romeo & Juliet (Juliet), & Others. TV: Dancing with the Stars, Late Night w/Conan O’Brien, Shoprite. Love to her husband, Dewey! Alexander Cruz (Jose) is a graduate of Rhode Island College with a BA in Mass Media Communications. His previous credits include Bernardo in West Side Story (Theatre By The Sea), Mercedes u/s Jean Micheal and Jacob in La Cage Aux Folles (Goodspeed), Paul in A Chorus Line (National Tour), Bolo/Onstage Swing in West Side Story (National Tour), and was most recently seen performing with Selena Gomez on Saturday Night Live. Thanks to family and friends especially Tyler, Brendan, Emilio and Kevin. Megan Rose Greene (Sissy) is a performer and filmmaker working out of Los Angeles. Her roots are in musical theatre and opera, with which degree she graduated Northwestern University. 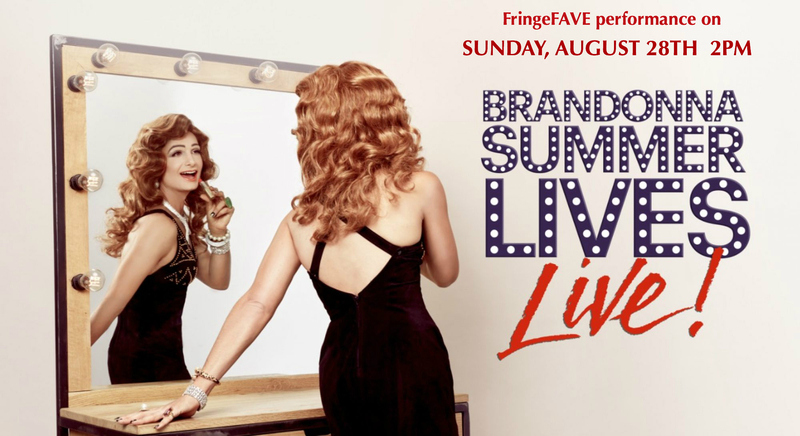 She’s glad to be out from behind the camera and onstage with Brandonna Summer Lives, LIVE! Inspired by that Grande Dame, Megan Rose is developing a one-man musical piece starring her own alter ego, Bill Gorton.Look for it at next year’s Fringe! Aaron Simon Gross (Director) has just graduated from Northwestern University, where he directed productions of GYPSY (The 74th Annual Dolphin Show), BUG, MERRILY WE ROLL ALONG, and ECCLESIAZUSAE, as well as premiers of WIPEOUT by Aurora Real de Asua and YOUNG WOMEN OF VALOR by Shara Feit. This October, he’ll direct BRIDGET BISHOP by Jared Sprowls for The Araca Project. Thanks to his family, Paradigm, Brandon, Aaron, Adam, Zach, Margot and this fabulous cast. Jade Yee-Gorn (Costume Designer) specializes in custom clothing, costumes, celebrity tailoring for the fashion and media industries. Her experience includes runway, editorial, film, television, theatre, concert tours and music videos, as well as red carpet events. With a decade’s worth experience and a diverse body of work Jade has a unique ability to move between the worlds of fashion and entertainment. Jade obtained her BFA in fashion design with a minor in costume design from Woodbury University. Phoebe Tureen (Costume Designer) is a Los Angeles based celebrity stylist, costume research consultant for Academy Award winning designers and a mother of two. When her daughter asked her for a chandelier for her birthday, she proudly hung one in the foyer of her daughter’s bedroom suite. Margot Whitney (Stage Manager) Margot is thrilled to be apart of BRANDONNA at Fringe. Credits include: Rodgers & Hammerstein’s Cinderella National Tour, War Horse National Tour, Signature Theatre Company, NY Stage and Film, La Jolla Playhouse, and Ensemble Theatre Cincinnati. Others: Virginia Opera, Cincinnati Opera, and Cincinnati Ballet. B.F.A. University of Cincinnati-College Conservatory of Music. Love and thanks to family and friends! Adam Boncz (Project Coordinator) got his certificate in Arts Management at the State University of New York. With his company SceneHouse Productions he has produced the world premiere of Fatelessness based on the novel of Nobel Prize winner Imre Kertész. The show was nominated for an New York Innovative Theater Award. He was also the executive producer of O.Rex, an immersive theater production by Gia Forakis & Company. As an arts manager he has collaborated with the Times Square International Theater Festival, the interdisciplinary opera Women:The War Within at the Baryshnikov Arts Center and the Dries Van Noten Retrospective at the Museum of Les Arts Decoratifs in Paris. He also served as a casting associate in David Michalek’s critically acclaimed project Figure Studies commissioned by Edinburgh Fringe Festival. Aaron Grant (Executive Producer) is an independent General Manager and Producer who has been active in the theatre for over a decade. Favorite projects include 2010’s White’s Lies at New World Stages (which finished a successful run in Michigan in 2013), 2014’s critically acclaimed off-Broadway production of The Anthem, the national tour of Almost Heaven: Songs of Jon Denver, The Screwtape Letters, Grumpy Old Men: The Musical, Minimum Wage, Stormy Weather: The Lena Horne Musical and Elizabeth Swados’ Rachel and Leah. Aaron is also the General Manager for the Ensemble for the Romantic Century. Projects in development include Brave New World: The Musical, Breaking Bobby Stone, Ghostlight: The Musical, Songbird and Who’s Holiday. In 2013 Aaron opened AARON GRANT THEATRICAL prior to which he was General Manager at Kelvin Productions with the late Vincent DeMarco.